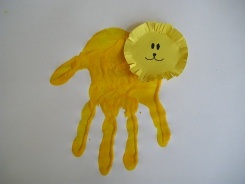 This Hand Print Lion is a great craft for Toddlers and Preschoolers on up. They can make the hand print, and you can help them make the lion's face! If you don't want to make this quicker (and a little less messy) you can always trace and cut out a yellow hand print instead of using paint. 1. Pour some yellow paint into a paper plate. Smoosh a hand into the paint and then press onto a piece of paper. 2. Turn the paper around. Cut a circle out of construction paper and cut little slits all the way around to make the Lion's mane. Draw on your eyes and mouth and glue onto the hand print.